Last Saturday, I had a day off…kind of. I had originally picked it up, but found someone to cover it for me because I needed a mom day. We had mentioned going shopping at the Amish and a few other things, but just decided on staying home–And it was surely the best decision ever. Before when mom and dad lived at the farm, mom worked on her early learning website Makinglearningfun.com and blogging full time. At the time, I worked a 8 to 5 (or whenever I wanted, as long as it was 8 hours a day) Monday through Friday and had 3 weeks of vacation to use. I’d come home most weekends and took a few days off here and there just to come hang out. Fast forwards a few years–Mom is doing in home childcare 10 hours a day, still blogging full time, and working on her website. I’m in nursing school full time working as much as I can on the weekends, odd shifts and picking up hours as much as I can (mom recently banned me from picking up more hours than I was already scheduled for). Needless to say, we both are stretched to the max and don’t have tons of extra time. There have been a few days that I’ve stopped over after class and hung out with the kids, but haven’t really had a chance to just hang with mom and have a girl’s day. It’s been a really long time since I’ve even touched a sewing machine, much less actually made progress on a project. So when we decided to stay home, I was really excited! Who wouldn’t want to stay home and sew on a quilt in sweatpants! I brought with my Garden Party quilt that it seems I’ve been working on forever! I have all of the colored blocks done, but haven’t quite finished the red and cream ones. But Saturday, they got finished! I even brought Puppycat with for a play day with Ruby and Betsy! She had to take a break a few times from playing and wrestling to come hang out with me and get a pet or two! Overall, it was a pretty wonderful day. There’s not a whole lot that a day with your momma can’t fix. When people ask me what I’m looking forward to after graduation, I would say that hanging with mom is definitely at the top of my list. I’ve really missed her! This entry was posted in Uncategorized on November 30, 2016 by Kelli. Wow, what a wonderful day you must have had. Wish I had a daughter close so we could do that! 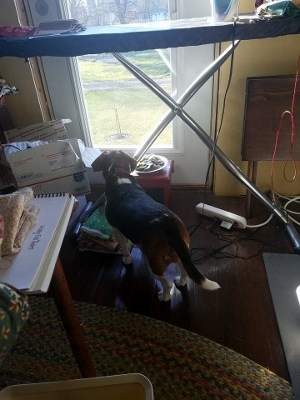 The daughter that likes to sew and craft lives over a mountain pass and 200 miles away, so we seldom see each other in the winter, because of the snow and ice over the mountains. So happy that you had this day with your Mom! I love my daughter and get to see her every two or three weeks, which is great. Plus, we talk almost every day. But I failed to pass on my love quilting and gardening. Perhaps one day, when she has her own house, she will get into some of these hobbies . glad you got to have such a joy with your mom! And a break from classes! Wahoo! 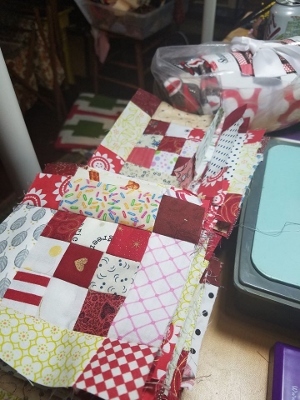 What cool red and white blocks – looks like you have a great variety of fabric in those blocks. A great way to spend the day – hope you had some good chocolate to keep you going! You are a very lucky girl Kelli! My mother taught me to sew when I was quite young, but I joined the Army after high school and moved to Colorado. I haven’t sewn with my mom since then. 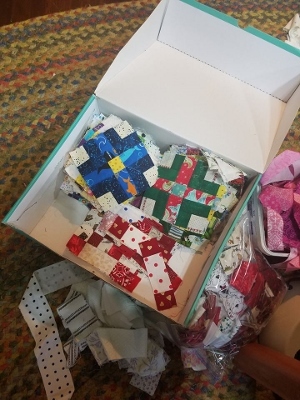 My mother-in-law was the person who got me interested in quilting. Being from southern Florida, quilts weren’t real popular but my MIL is from Connecticut where everyone loved quilts. It wasn’t until I retired, that I was finally able to make my first quilt. Just enjoy every second. I used to sew/quilt with my Mom and loved it, but I think I took it for granted. She has been gone for 6 years now, and I still miss her & our sewing times together. I’m sure there’s not a blog reader among us that didn’t absolutely love this post and get teary eyed reading it-I know I did! Enjoy both of you!!! The best compliment you can give a mother is that you want to spend time with her!